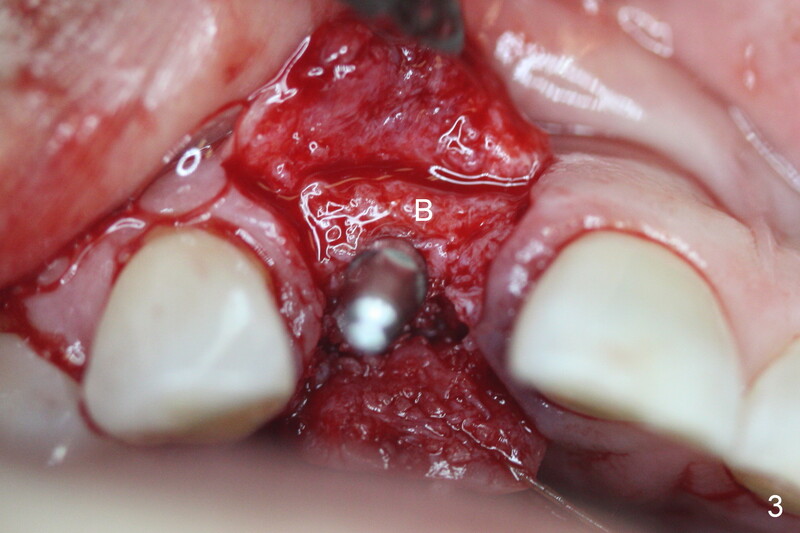 When the alveolar crest is exposed, osteotomy starts palatally as planned. 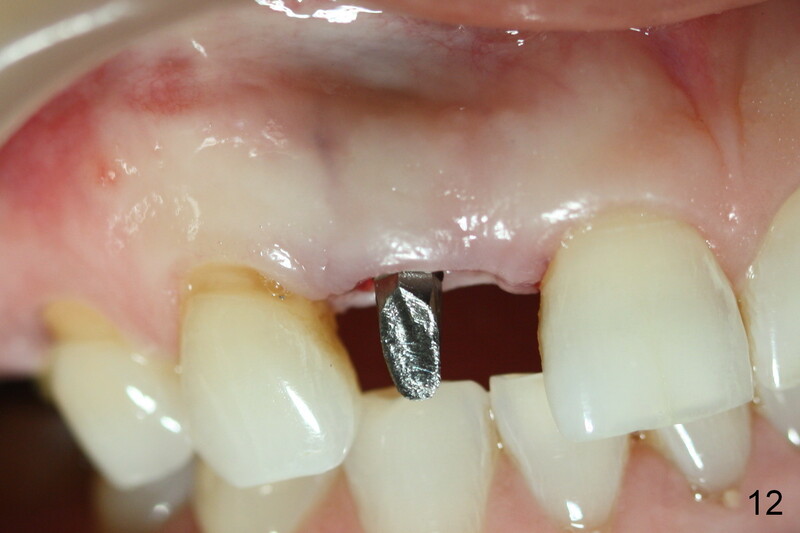 It appears that the tip of 1.2 mm pilot drill perforates the buccal plate at the buccal undercut area at the depth of 10 mm. 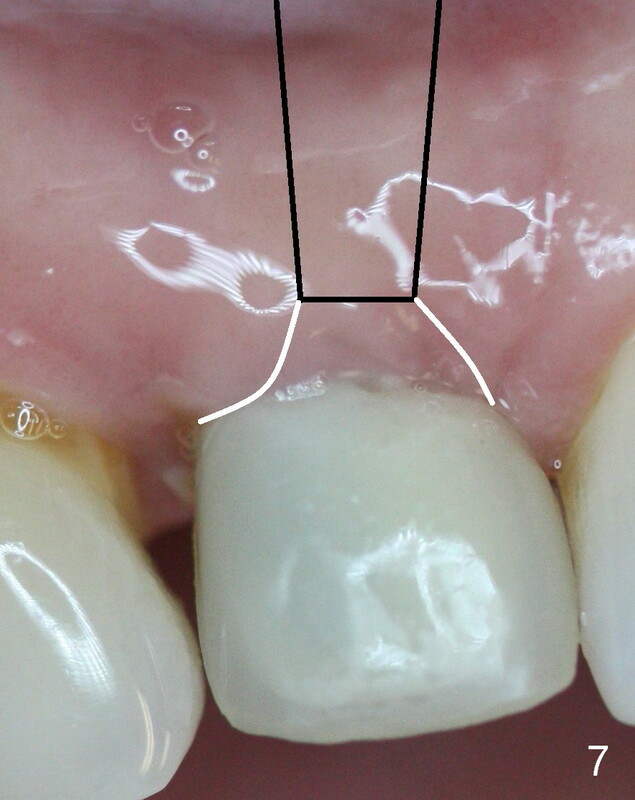 The drill is re-directed with the coronal end of the drill is deviated buccally (Fig.1). 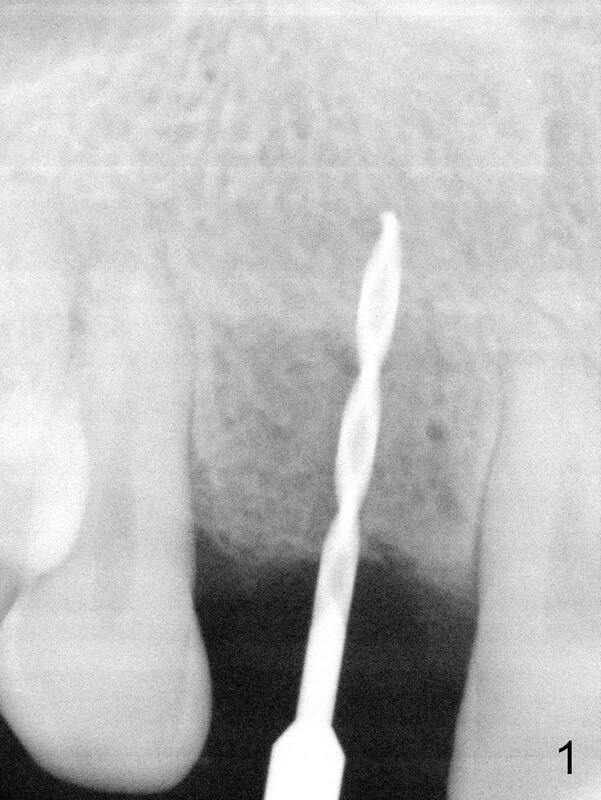 Then the depth is extended to 12 mm, followed by 1.5 mm drill at 10 mm and 2 mm at 8 mm. 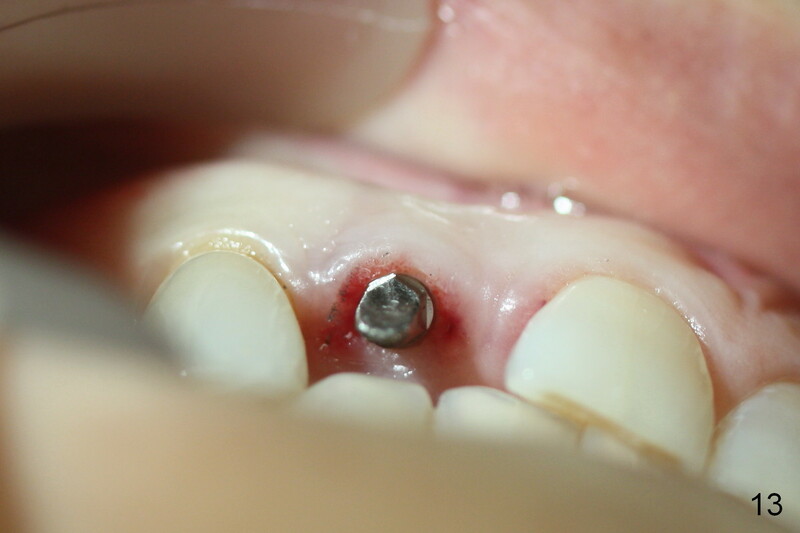 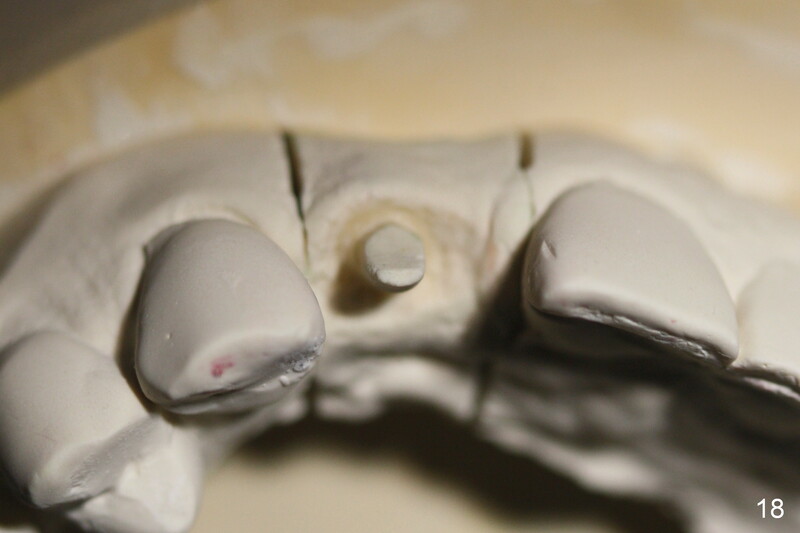 A 2.5x12 mm 1 piece implant is placed (Fig.2). 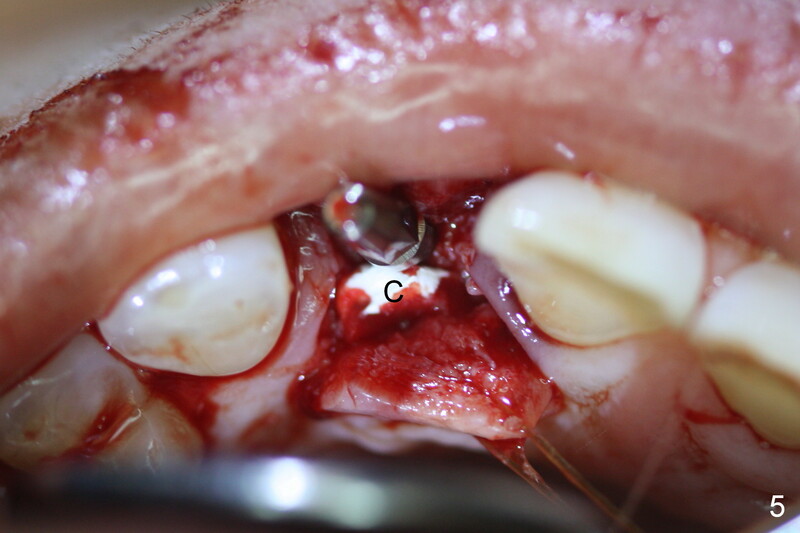 The implant is then placed ~1 mm deeper with final insertion torque 45/50 Ncm with the intact buccal plate (Fig.3 B). 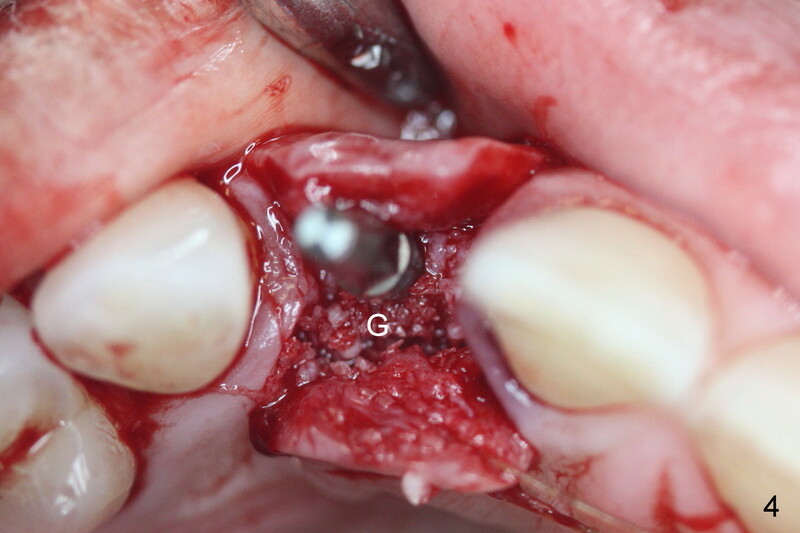 The thin coronal palatal plate is packed with mineralized allograft (Fig.4 G), followed by collagen dressing (Fig.5 C). 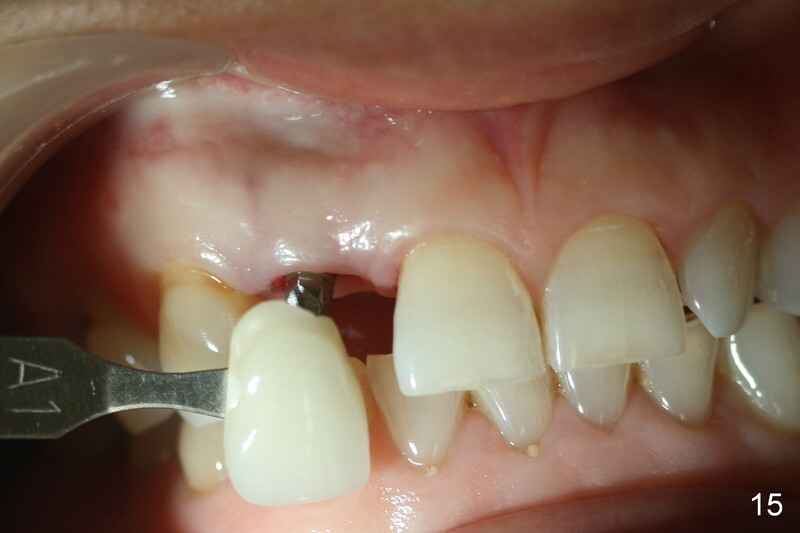 An immediate provisional is fabricated after trimming the buccal aspect of the abutment. 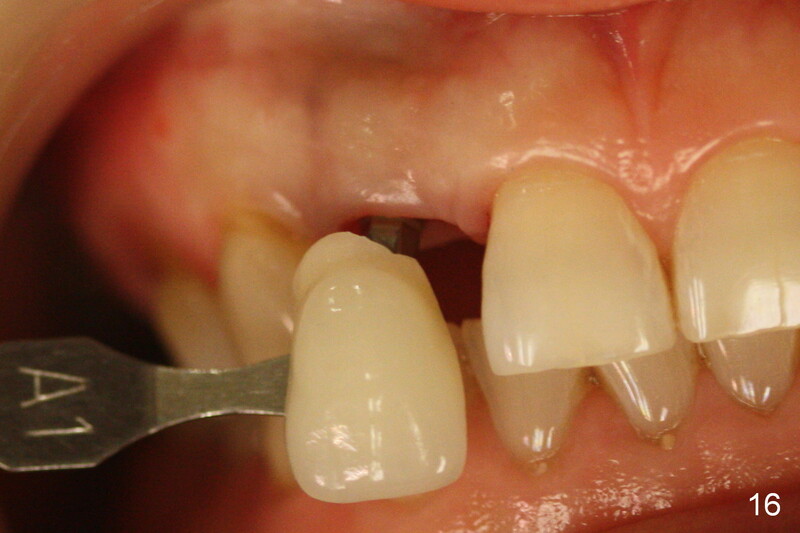 The provisional is temporarily cemented without occlusal contact. 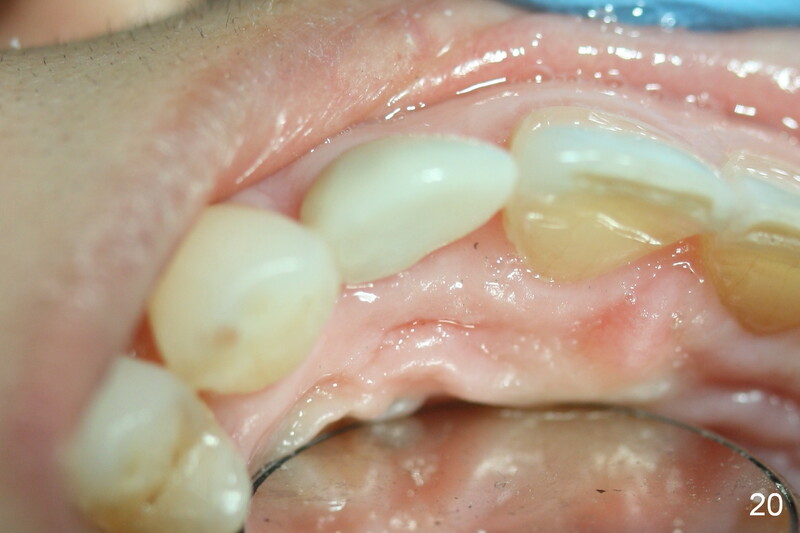 The provisional and implant remain stable with soft tissue healing 3 weeks postop (Fig.6). To regenerate the distal papilla, the provisional should be changed from the concave (Fig.7 white line) to convex (Fig.8 green line) so that the gingival tissue can be pushed coronally (Fig.9 curved grey arrow). 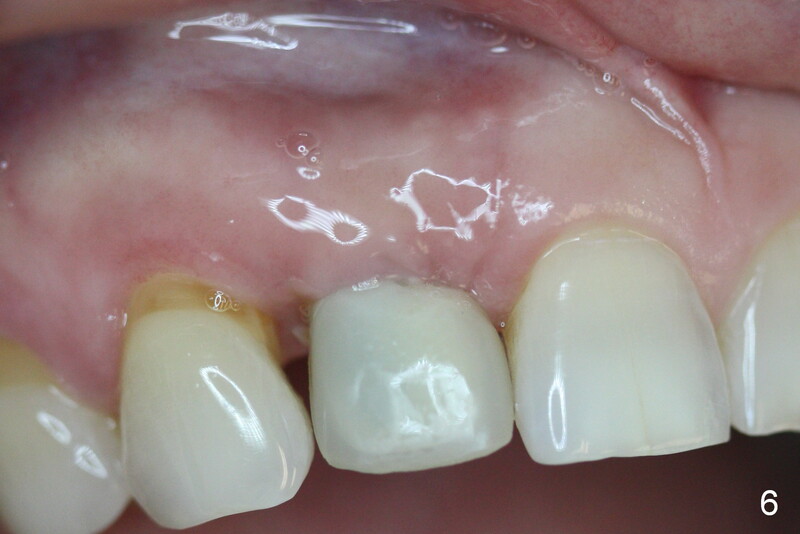 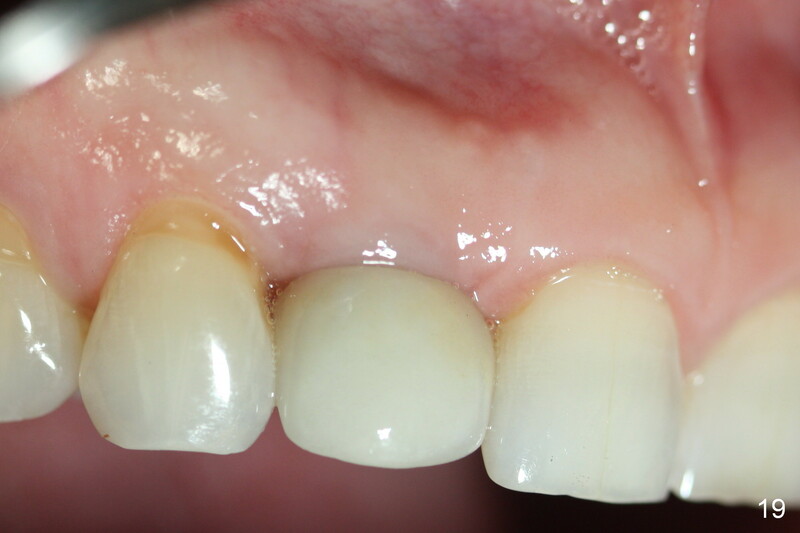 The patient returns for final impression 5 months postop: there is minimal bone resorption (Fig.10). 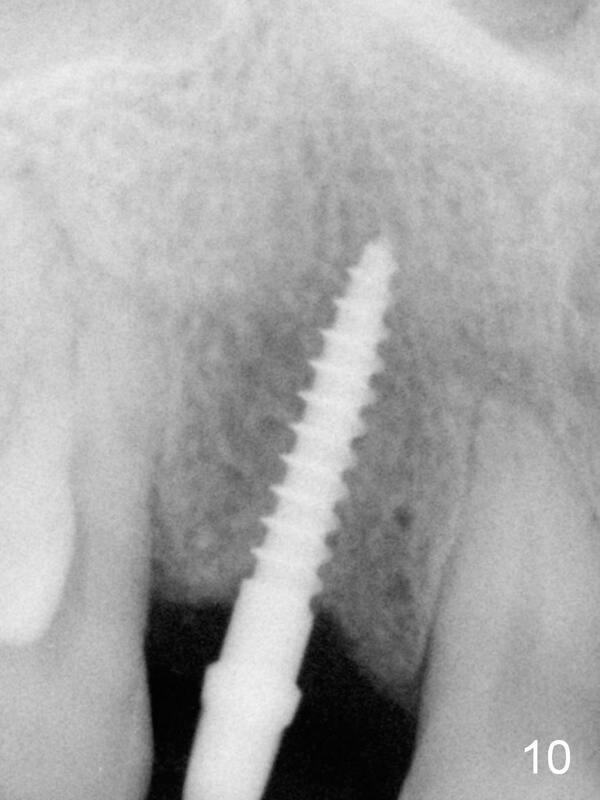 After reprep (Fig.12,13), the provisional is reseated (Fig.11). 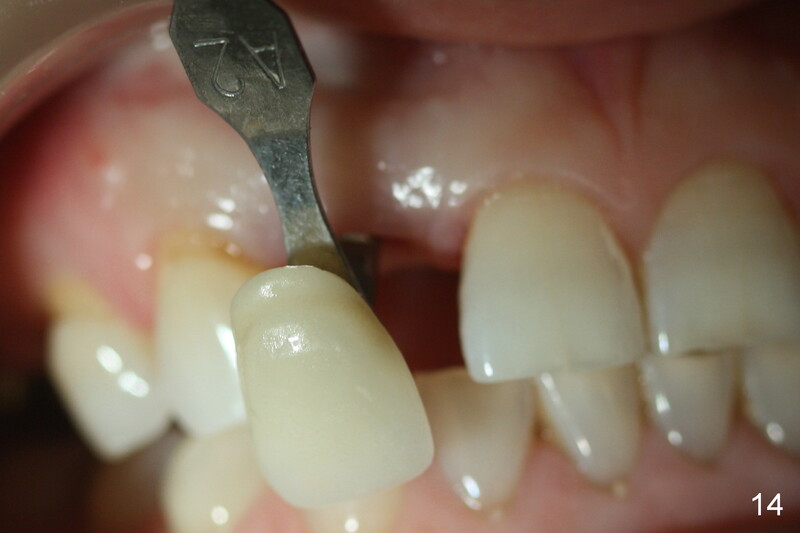 Shades are being selected (Fig.14,15 (with dental chair light), 16,17 (room light)). 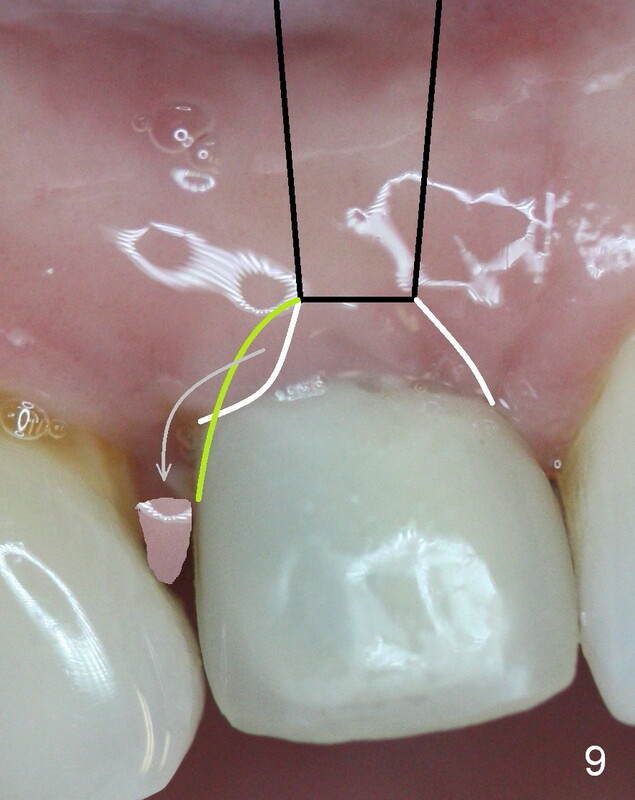 The ideal position of an implant at the anterior region should be in the confinement of the neighboring teeth with the incisal edge at the straight line of the ones of the neighboring teeth (Fig.18). 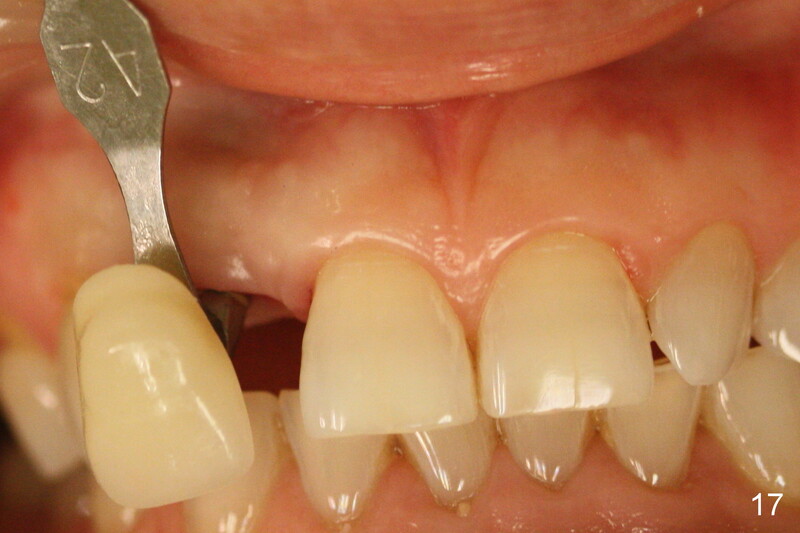 Deviation may lead to restoration challenge. 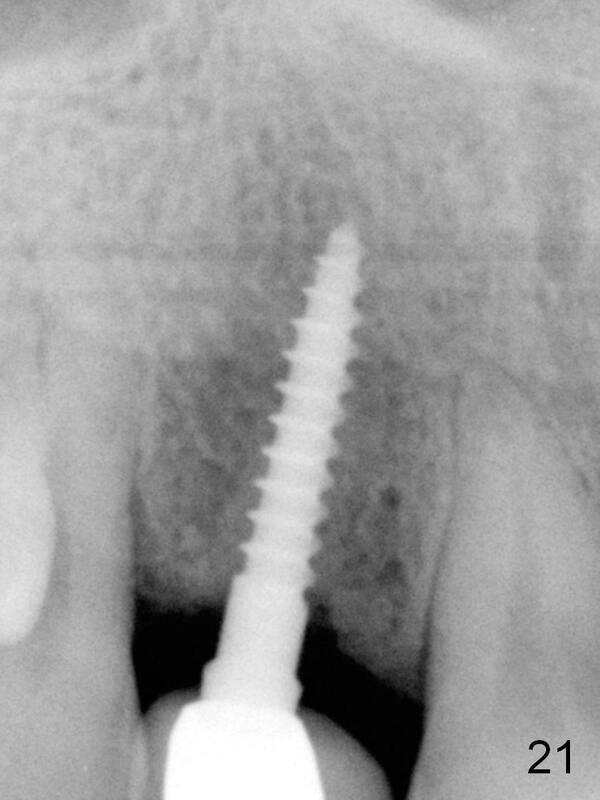 The patient returns for #3-4 provisionalization 20 days after permanent restoration, 6 months in functioning (including provisional) of the implant at #7. 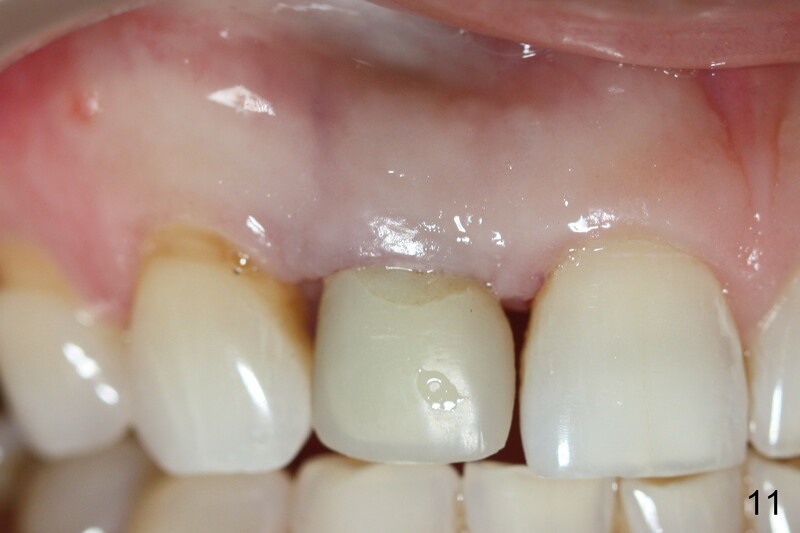 Both the labial (Fig.19) and palatal (Fig.20) gingivae look healthy. 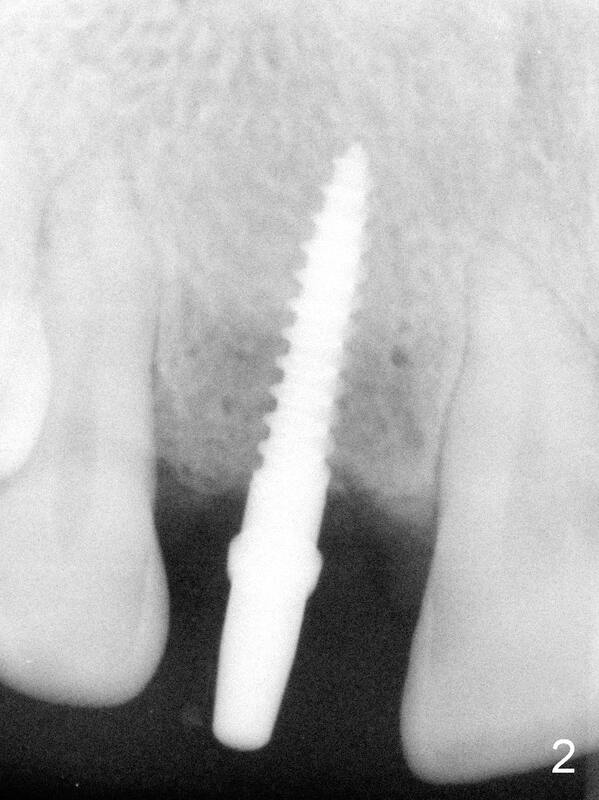 There is no further bone resorption 11 months post cementation (Fig.21, as compared to Fig.10), while bone density immediately next to the implant appears to increase (arrowheads).